Wolverhampton-born singer/songwriter Dan Whitehouse is welcoming Ivor Novello-nominated Boo Hewerdine to his home city for a special Christmas show. 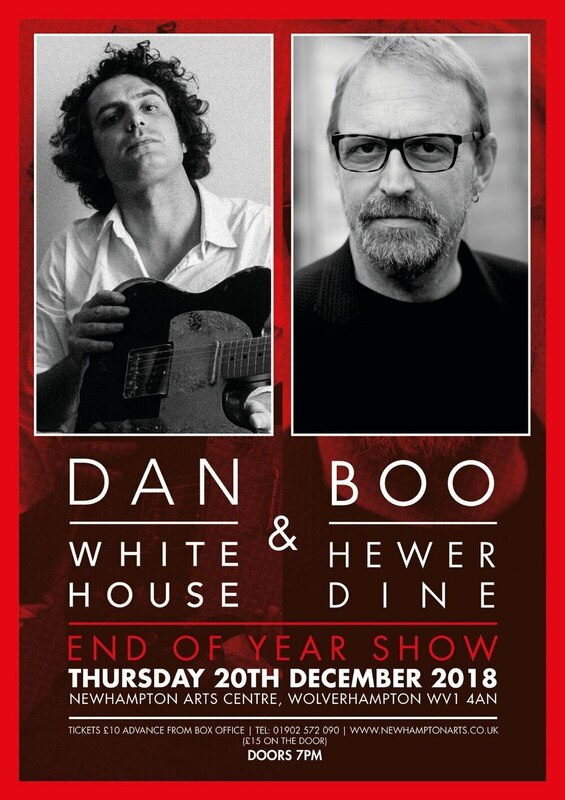 On December 20, Dan will bring Boo to the Newhampton Arts Centre on Dunkley Street, debuting material from his forthcoming new album - which is as-yet untitled - that is produced by Boo. Signed to Reveal Records last year, Dan has toured and collaborated with label mates such as Brooklyn’s Joan As Police Woman, multi-BBC Folk Award winner Kris Drever, Eddi Reader MBE, The Little Unsaid, as well as Boo, while performing his own sell-out headline shows. On top of that, he runs his Songwriting Circle workshops at Birmingham's MAC theatre where he helps fellow budding musicians to improve their writing and produce their own material at his Reveal Records studio. Releases in the past year have included the debut EP from Wolverhampton-based singer Eileen Quigley as well as the debut record from former The Ticket unsigned page star Danielle Cawdell of Cradley Heath. Dan's career path has been a slow-burn success, establishing himself as a much-loved songwriter with each new release, and picking up five-star reviews for what's been described as 'Black Country Soul'. He also won the Best Folk/Country Artist award at this year's Birmingham Music Awards. Dan will also have a new CD available to sell at the show featuring live versions of songs from his forthcoming album. The EP is available exclusively at shows, and limited to just 200 copies. Boo Hewerdine first came to prominence in the late 80s with his band The Bible, before going on to establish a successful career as a solo artist, songwriter and producer. Scottish musician Reader is the perhaps the artist Boo is most regularly associated with. Together they have enjoyed international success with hits including Patience Of Angels and her classic Sings The Songs Of Robert Burns album. Currently touring with, and writing songs for, Squeeze's Chris Difford, Boo's most recent release is 2017's autobiographical Swimming In Mercury. At the gig, both artists will perform together, as well as performing individual solo sets. Doors on the night open at 7pm, with Boo's solo set between 7.30pm and 8.30pm; and Dan's solo effort between 9pm and 10pm. Following that, Christmas drinks will be served between 10pm and 11pm. Tickets are £10 in advance and £15 on the door.